There always seems to be a demand for amusing images of pets as they are so playful and enjoy clowning about. Baby lories are just so cute that photos are a must. 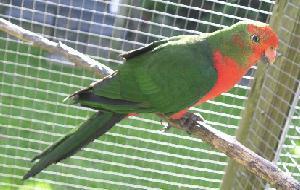 There is often a demand for good lory photos for publication in magazines and nearly every photo can be placed on a web site. Most people already have a camera of some type but for lory owners without a camera there are the very very low cost disposable types which will, at least, give acceptable images in good lighting conditions. Baby lory images are always popular and since lories grow and develop so quickly, in about 10 weeks, it is a real good idea to get many baby images. Digital cameras have become more popular in the last year or so and offer a much lower cost per photograph than the traditional film/print processing methods. Apart from this major cost saving the opportunity is now there to take an almost unlimited number of images and this provides a much higher probability of obtaining that excellent (one-off?) image. Digital processing on a home computer can allow detailed image editing, colour and brightness enhancement and general image manipulation into text and web pages. Images from a digital camera can often be directly downloaded to a computer. Prints from film can also be digitised using a low cost scanner. Usually no problem but try to avoid flashing too close to a bird's face as just like humans it will be dazed and maybe stunned by the light. 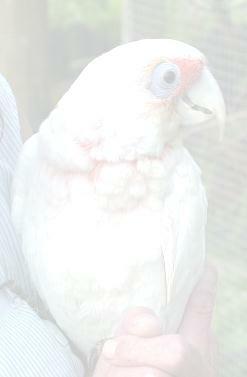 Use flash if taking an image inside an aviary or room as there will just not be enough light for a natural light photo. Many cameras will slow the shutter speed in low light conditions and this can lead to an out of focus image as the bird may move or the camera may shake. Many bird photographs suffer from the bird part of the image being too small with the bird occupying less than 5% of the actual image area. Quite often this will mean getting real close to the bird, almost 'in its face' so that the finished photo is actually of the bird and not its surroundings. Many interesting lory images involve the lory at some activity, for example, eating a particular food, playing with other lories or with a toy, flying, playing with or on a human, preening, sleeping, bathing or just relaxing and singing. 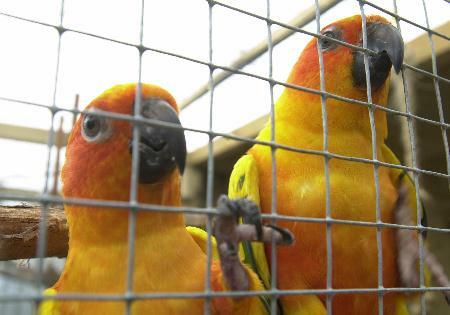 Try to avoid taking any photograph of birds through either aviary wire or cage bars. Many cameras with autofocus will focus on the nearest object and this will usually be the wire instead of the bird. This is also more likely to occur so in low light conditions where there may be limited depth-of-field available and a fuzzy image of a bird with perfectly foccused wire can be the result. 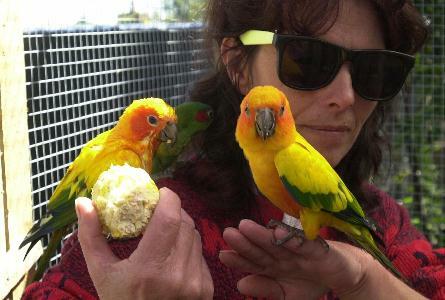 Try to either get inside the aviary or remove the bird to a more suitable setting. A neutral background will highlight the bird image, a busy or highly coloured background will divert attention from the bird. Avoid taking a photograph against a bright background. Many photos of a bird in an avairy will have the bird clinging to the wire mesh or on a high perch in such a way that the camera is angled upwards. Unless a fill-in flash is used the image may be of a dark featureless/colourless bird again a bright sky. Even with spot meter exposure the image of the bird may be good but the background washed out because it is overexposed. In worst cases this may ruin the edges of the bird image as plumage is brightened or washed out to be colourless. Try to encourage the bird down to a lower perch or to a position where the camera is not pointing either to the sky or a darkened recess of the aviary. This device is a specially designed enclosure/cage in which a bird is placed to provide a standard background, as close as possible standard pose and at a position where the focus is predetermined and lighting is just about perfect. With all of these factors accounted for the only thing left to do is to get the bird to cooperate by sitting on the assigned perch perferably in the correct direction. Since a larger number of photographs will be taken in this controlled environment there will be a higher proprtion of quality photos and much less wastage of film and other resources - such as the photographer's time! Although a photo-box will enable good high quality bird photgraphs it has, however, taken the birds away from their normal surroundings. This means their natural behaviour, normal surroundings and interaction with other birds is missing and capturing the 'character' picture is impossible. This may not matter if the purpose is to record plumage or growth or some change to the bird's normal appearance. Tile Pattern: Young long-billed Corella. Last modified: 1 March 2003.